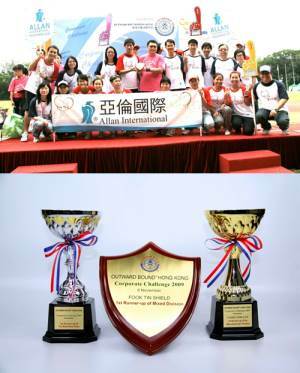 Allan International participated in the Outward Bound Corporate Challenge 2009 held at Sir Philip Haddon-Cave Sports Field, Chinese University of Hong Kong on November 8, 2009. Through participating in this event, Allan provided support to Outward Bound in their Special Community Based courses for the less privileged, the Samaritans, Mother’s Choice, Second Chance programmes , and the Operation Breakthrough. At the same time, the Allan team also gained valuable experience in team building and problem solving. We look forward to facing the challenge next year and we will fight for a better result.